Pirates of the Caribbean will close for a short refurbishment from April 28 through to April 30. Tomorrowland Transit Authority Peoplemover will be closed from May 3 – July 1. New – Carousel of Progress will close for a refurbishment from August 25 – September 4. Main Street USA work is being done as part of a large project that will create a second ring around the current hub that adds more walkways and dedicated viewing areas for Magic Kingdom fireworks and parades, as well as sculpted gardens. This enhancement project will be completed sometime in 2015. The Fantasyland Expansion is currently underway and is scheduled to open in phases through 2014. A new roller coaster called the Seven Dwarfs Mine Train will open in Fantasyland sometime in the Spring of 2014. 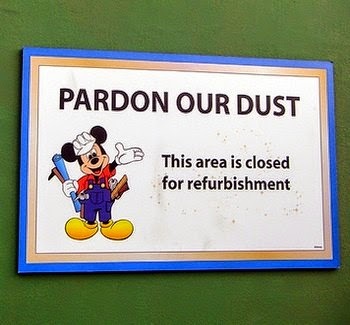 No refurbishments at this time. Mickey’s Jammin’ Jungle Parade is slated to end permanently sometime in June. New – It’s Tough To Be A Bug will be closed for a refurbishment from July 7 – August 11. Camp Minnie-Mickey has closed forever. Festival of the Lion King will eventually reopen in an all-new theater in the Africa section of the park in the Summer of 2014. Camp Minnie-Mickey characters meet and greets have been moved to new locations throughout the park. Disney Parks has announced a long-term relationship with James Cameron’s Lightstorm Entertainment and Fox Filmed Entertainment to bring the fantasy world of AVATAR to life at Animal Kingdom Park. The new Avatar land will feature multiple attractions, entertainment, merchandise locations, restaurants and other immersive elements to bring the world of Pandora to life. Construction is expected to end in 2017. Construction has begun on the new Disney Springs project. For more information about this project, please read this blog post. Pollo Campero, Bodie’s All-American Grill and BabyCakes NYC Bakery, all located inside the Pollo Campero building has closed. The building has been demolished to make way for the Disney Springs development of the Downtown Disney Marketplace area. BabyCakes NYC will continue to provide gluten-free products to select Walt Disney World Resort food courts and restaurants. Team Mickey’s Athletic Club at Downtown Disney Marketplace has closed to begin conversion of the location to the new Marketplace Co Op that will feature 6 unique stores. The Marketplace Co Op is expected to open in spring 2014. Kouzzina Restaurant by Cat Cora will be closing permanently after September 30. A new restaurant will open at the BoardWalk in late 2014. ‘Never Land Club’ children’s activity center will be closed through April 27 for refurbishment. Captain Cook’s is closed for refurbishment through sometime in June. An alternate Dining Experience is available for guests. Resort Renovations are taking place that will enhance the entire resort. The renovation will impact views from some rooms in buildings 5, 9, 10 and 11. Also, a portion of the east parking lot nearest to building 11 will temporarily close. In addition to that, access to the beach area on the east side of the resort, as well as Sunset Pointe will be unavailable.